Welcome to Heritage of Faith Gold Coast, a Christian Church located on the sunny Gold Coast of Queensland Australia. Find out more about us with a special word from our Senior Pastor Ian Slack. We would love you to join us this week at our Gold Coast Campus for an amazing time with our father God. 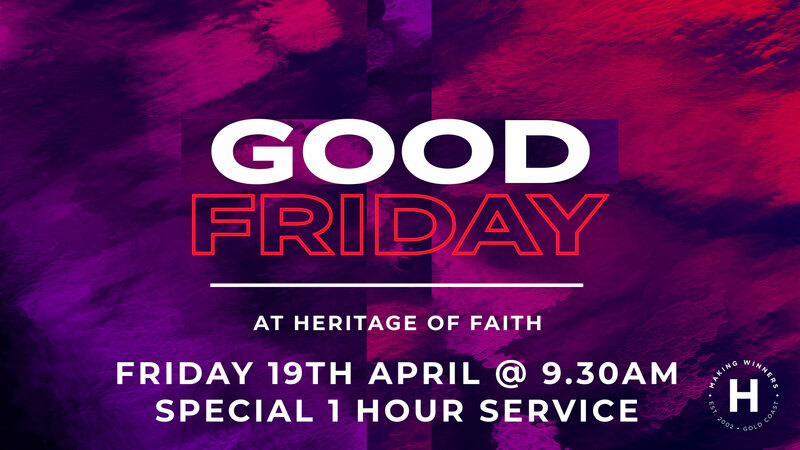 Be blessed with what God wants to do for you at Heritage Church Gold Coast. Our main service is held each Sunday morning at 9.30am. Join us for a intimate time of live Praise and Worship with relevant God given Bible based preaching from our dynamic team. God is always the main focus of our Church services and everything that we do where we allow time for the Holy Spirit to run His service. Heritage Kids is also available with various aged classes. We also offer a Hard of Hearing ministry with sign language interpretation. Please contact us for more details. Heritage of Faith Gold Coast’s sermons are uploaded to iTunes and available for free audio & video download from the podcast directory as well as being available online through our social media channels. If you are new to our Church, we would love you to stay behind and join us for coffee and meet our pastors. Our cafe is open for free tea and coffee before & after the service, so make time to stick around, meet someone new and enjoy the fellowship. We also hold a all Church Thrive group twice a year, where the whole Church stays for lunch and has a chance to meet someone new and fellowship with friends. This is a great way to meet people in our Church and enjoy a delicious meal. You will also have the opportunity to hear a word from one of our team. Thanks for taking the time to visit our website and we look forward to connecting with you as you learn the heart of Heritage of Faith Gold Coast. Heritage Church is the Church Arm of Jerry Savelle Ministries and we have several campuses within Australia including Gold Coast, Port Lincoln & Stanthorpe as well as our international campus in Papua New Guinea.